LIVONIA, Mich. (April 17, 2006) – There are trucks, and then there are trucks - and the new ROUSH Stage 3 version of the Ford F-150 certainly ranks among the highest predators on the truck food chain. Now in production and available at dealers nationwide, the ROUSH Stage 3 F-150 flies down the road thanks to the 445 horsepower and 500 lb-ft of torque generated by the addition of a ROUSHchargerTM system. This is a substantial increase in power and performance over the 300 horsepower and 365 lb-ft of torque that is generated from the stock Ford factory 5.4L, 3-valve engine, and the entire truck, including the ROUSHchargerTM is covered by ROUSH’s industry-leading 3 year/36,000 mile warranty. This vehicle was designed by the same engineers that have helped Jack Roush win 34 racing championships, including a pair at the elite NASCAR Nextel Cup level. The intercooled ROUSHchargerTM includes a custom calibration which optimizes engine performance and transmission shift points. But the ROUSH Stage 3 F-150 is more than just engine. This package also includes the styling and body kit enhancements of the Stage 1 version, and the suspension upgrades that are incorporated into the Stage 2 version of the truck. The tuned sport suspension system under the Stage 3 offers a balance between comfort and handling capability, without significant reduction in payload capacity. These engineered and tuned components include specially valved front and rear shock absorbers, increased rate rear leaf springs, front coil springs, and a large diameter solid front sway bar. The ROUSH Stage 3 F-150 also comes with custom 20-inch rims and tires, both from the new line of ROUSH Performance wheels. Some of the exterior styling additions include a front chin spoiler, hood scoop with carbon fiber design insert, and the optional side skirts with dual side outlet exhaust tips, wheel flares and tailgate spoiler. Other amenities include specially-designed instrument clusters, custom leather seats, billet aluminum grille and pedals, embroidered floor mats and much more. Of course, each ROUSH vehicle comes with an individual serial plate indicating that it was hand built by specially-trained ROUSH technicians at their Livonia, Mich., facility. There was no component on this truck that the ROUSH engineers overlooked. They went over the F-150 from top to bottom and changed any of the components that would help the performance or handling of the vehicle, all while keeping the rugged styling that ROUSH has become known for,” said Joe Thompson, general manager of ROUSH Performance Products. 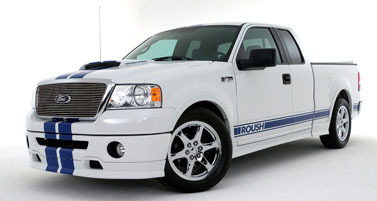 Other options available for the ROUSH Stage 3 F-150 include dash trim kits, locking lug nuts, and striping packages. Still available are the Stage 1 and Stage 2 versions of the ROUSH F-150 for drivers wanting elements of the package, but not the complete ROUSHcharged truck. Based in Livonia, Mich., “The Art of Performance Engineering” takes place at Roush Performance. In addition to the Stage 1, Stage 2 and Stage 3 Ford Mustang and F-150 styling, handling and performance upgrades, a complete line of performance parts and modular engines are offered. For more information see your local ROUSH dealer, visit www.RoushPerformance.com or telephone toll-free (800) 59-ROUSH.